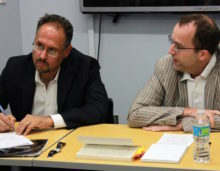 On September 23, 2016, the NYU Jordan Center for the Advanced Study of Russia held a panel to discuss Michael David Fox’s recent book, Crossing Borders: Modernity, Ideology, and Culture in Russia and the Soviet Union. David-Fox, who is Professor in the Edmund A. Walsh School of Foreign Service and the Department of History at Georgetown University, kicked off the discussion with an introduction to his book, a collection of essays that address fundamental analytic categories across multiple fields. Yanni Kotsonis, Professor of History at New York University introduced the panel’s scholars, who represented three different fields: Mary Nolan, Professor of History at NYU, Tarik Amar, Associate Professor of History at Columbia University, and Rossen Djagalov, Assistant Professor of Russian and Slavic Studies at NYU. Much of David-Fox’s presentation was framed on the concept of modernity, “which everyone loves to hate, but is a good device because it allows us to talk across disciplinary boundaries,” he said. In fact, the first section of his book explains “the big problem of Russian/Soviet modernity.” It then turns to certain aspects of the Soviet system that are often considered the most conceptual: the problem of ideology, the particular nature of the party-state and Soviet culture. The book wraps up with a discussion of Soviet history and historiography and transnational history. The central point in Crossing Borders argues that all of these areas are interconnected. It also grapples with the tendency in the field of Russian studies for scholars to choose between seeing Russia as exceptional versus putting Russia into comparative or international contexts. To David-Fox, there is a middle ground between those two poles. “We can and should talk about Russian modernity and its distinctiveness at the same time,” he said. Another contemporary issue raised by David-Fox’s book is that “in the public discussion of today’s Russia, not just among journalists but historians, the notion of an ‘eternal Russia’ is back in a very big way.” An increasing number of people talking about Russia invoke simple, straight-line theories and essentialist continuities, not only regarding the Soviet past, but also the half millennium before it, David-Fox explained. Fighting essentialism was a key aspect of David-Fox’s book, which examines the Russian-Soviet variant of modernity, the period between The Great Reforms spanning to the mid-20th century. The author also explained a term he coined in the book, “intelligentsia statist modernity”—a combination of the particular enlightening, didactic mission of the intelligentsia to serve and reshape the masses and the Russian tradition of étatism, which eventually fed into what became the Soviet system. In his discussion of modernity, David-Fox mentioned that today’s Russia evokes simple continuities with the past for many observers, but that the notion of “intelligentsia statist modernity” leads to an appreciation of certain radical breaks between today’s Russia and its Soviet past. While the statism remains, the intelligentsia as a distinctive force started to fade in leading and serving the masses and reshaping them already in the late Soviet period, David-Fox said, meaning that Russia today is looking backwards at imagined past glories. Speaking next, Tarik Amar said that seeing David-Fox’s work as a “middle ground operation” between the two poles in the field was almost too conciliatory, and lauded the book for offering a fundamental critique of both paradigms. The central question to him, Amar said, is about whether Soviet modernity was different in some way. The answer to that question could be explained with references to the extent of the Soviet project, its timing or conjuncture, as well as interactions it engendered between East and West, as well as between ideologies. A valuable aspect of the book, according to Amar, is its exploration of the resistance to modernity as an explanatory approach in Soviet and Russian History and pinpointing what exactly is so irritating about modernity as a heuristic device (all the ways it’s wrongly applied is one example Amar brought from the book). On the other hand, Amar said, what the book doesn’t do is search for an ex planation for this question within Western intellectual thought. The biggest question Amar discussed was that of failure. “One way to neutralize some of the problems that modernity can provoke as an explanatory approach is to upfront acknowledge that this is a failed form of modernity” he said. In questioning where this failure actually comes from, one explanation he offered was the lack of reflexivity, the capacity of the state to think about itself. This question, Amar said, also brings us to the question of contingency. Referring to President Vladimir Putin’s recent comment that the collapse of the Soviet Union could have been avoided, which he called a banality, Amar said the question is if it should have been avoided. “If failure is contingent, then all other explanations have to be qualified, especially geopolitics,” Amar said. Following Amar, Rossen Djagalov mentioned that for him, Crossing Borders was “a primer in the strange and fascinating world of Soviet modernity and the debate surrounding it.” He added, however, that he was not satisfied by the terminology of the debate. He advised against reducing the debate to two sides—that on the one hand there was change and on the other there was continuity. Ultimately, he said, “without an agreement on the criteria for what constitutes modernity or tradition, this debate will remain unresolvable.” He cited Eisenstadt’s work as useful in opening Soviet history to comparative frameworks, but as a comparatist by training, Djagalov said that he nevertheless sees certain limitations to this approach. “While it’s useful in establishing parallels and divergences within certain types of modern societies, it falls short in the realm of interactions among societies,” he said. Perhaps, he added, a neo-Marxist approach such as World Systems Theory could provide a better framework for comparison and critical interaction when looking at Soviet development. In the Q&A session that followed, many members of the audience raised questions about the term “failed modernity.” Jane Burbank, Professor of History at NYU, wondered if David-Fox’s model of the intelligentsia state really failed. In Burbank’s view, the state is a tremendous success story in that after a so-called regime collapse, it stayed intact, the systems recovered in a short period of time and loyalty remained. Yanni Kotsonis added that modernity has always been a heuristic framework, not a paradigm. Concerned with essentialization, he questioned what languages, idioms or modes of thinking can be used to speak about multiple places at the same time. “Can we assimilate them into a shared framework and have a conversation that makes Russia intelligible to the non-Russianist?” he asked. Tarik Amar added that to ask whether there was a failure of Soviet modernity, one also has to ask what failed modernity looks like. In response, David-Fox reminded the audience that his approach in the book is indeed more heuristic and theoretical; modernity is a tool to start a conversation rather than strictly define it. He conceded that after the collapse of the Soviet state in 1991, many middle level people experienced relative continuity in the system, even though a lot of high-level officials were thrown out. He agreed with Tarik Amar that “there was a collapse and there were deep roots to it that have to be explained” and added that he is influenced by debates in Russia about the Soviet legacy. Some, he said, reject wholesale the entire experience because it was part of that failure, but others argue that there was no tabula rasa. The author agreed that conceptualizing modernity is based on the context. For example, in the interwar period, modernity meant Fordism and mass culture, but the fact that the Soviet Union had no private property or civil society produced a different modernity than in other states. And today, as economics and geopolitics change, “you can’t talk about modernity in the same way in a changing international situation, just as we can’t talk about it after 1991 in the same way,” David-Fox said.